Well it is that time of year where we gear up and roll north to the hallowed bass ground of Bassachusettes and Chappaquiddick. Flies are tied, gear is prepped and all that is left to do is make the long pain-in-a$$ drive to Woods Hole and ferry over to the Promised Land for a week of striper thumb. Look for a report upon our return. Until then the site will not be updated until sometime mid-June. It feels like it has been ages since there was so much water in all the rivers that make up the Upper D system for a Memorial Day Weekend. And it was due to that fact, the pressure could be spread out over who-knows-how-much water - lets just say dozens of miles. Some years all the boats are jammed-up on one piece of water. 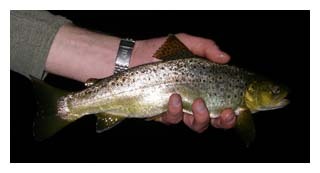 Hell, even some years the lower West is even too warm for ethical trout fishing. That was not the case this year. The main, the west, and the east were all floatable, and all had good temps, except for maybe the lower-Main once Monday of Memorial Day Weekend rolled around. And if you ask me, the main was the place to be if conditions permitted. It has been fishing very well and is loaded with trout. The bows are incredible this year. They seem to be everywhere you'd expect them to be. In fact quite a few times when we'd anchor up and study the water you would see heads popping all throughout the riffles just mawing down bugs. But you had to look closely, and know what to look for since the rise forms would dissipate almost instantly. And once magic hour rolled around, heads really were all over the place. During the day they seemed to be on olives, though a well places Iso was something they just could not resist. In the eve they switched over to sulphurs. Now on the west during the day you were able to drum up fish with your standard summertime-patterns. Don't wait for risers, instead just start casting and hitting the fishy water. Chances are, a fish will be there. Try either a large sulphur imitation or an iso, and then hang a dropper off of that. Go with either the nitro or a flashback pheasant tail. Get out there and hit. The system is really on fire this year! 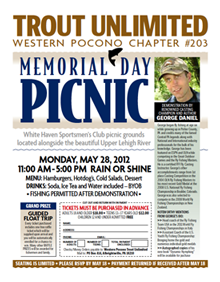 May 21, 2012 - Lehigh Update and Memorial Day Weekend Trout Picnic! The Lehigh is back down to a manageable level after that soaker we got last week. So with that being the case I suggest you get out there now, because who knows how long it will stay that way. Rain is in the forecast and with the pool at the target level of 1370' there is no room to store - according to the Corps - so whatever inflow is, you'll find the outflow at a similar cfs. 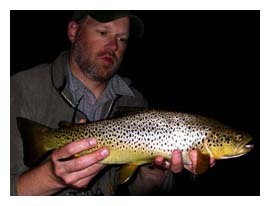 Currently there is 550cfs being released - which is somewhat manageable for the wade angler. However, downstream at Lehighton, you can see the tribs are still pumping a decent amount of water. Flow there is about 1,500cfs. Usually we find the release from Walter doubles, by the time you get to Lehighton. So obviously there is still quite a bit of water in the glens that line the Lehigh. Lots of bugs but no targets due to the dirty/stained water. Well, we got some rain last week which pushed Walter to its 1,370' target pool level for the recreation season. And so with that the Corps started to match outflow with inflow on Friday. Unfortunately that was also the day we were looking to float. Even with the release the levels were fine for floating, but the release made the water pretty stained with lots of suspended particulate. Even with this being the case we decided to give it a go. Undeterred we worked buggers with nothing to show for it. Not one bump the entire day. However, there were bugs hatching the entire time, so we were hoping something would materialize toward dark. And honestly, it never did. Perseverance did pay off though with one fish coming to net on a sulphur dry fished blind. Overall it was a pretty disappointing float. And with more rain in the forecast this week the release will only increase. Safe to say the low water of early-spring is a thing of the past! What shops like to referred to as stained! 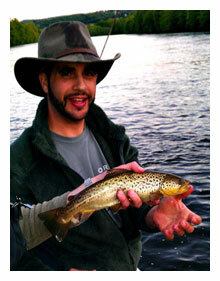 Tough fishing over the weekend on the Lehigh. Going into the float, I would have figured we would have had cooperative fish throughout the day. Reason - the water levels have been consistent, there was decent cloud cover and after all, it is May. We are talking Prime Time! Early-May and slow fishing, well, I guess it does happen. 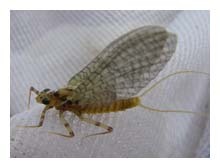 Anyway, we worked buggers and wet flies while looking for risers. All we had to show for the sub-surface action were a few hits/tugs here and there. The fish just seemed non-committal. And the risers never materialized until just prior to dark. And even then, they were few and far between. Reason being, the bugs never really materialized either. So with the lack of bugs, the fish just never had a reason to look up. Who knows, maybe we are in the lull between hatches. One thing of note is the fish seem very skittish this year. This is most likely due to the fact that they have been pounded since mid-March. 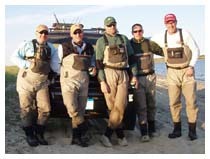 At the end of our float, the slow fishing was corroborated with the other guides on the river. For those that don't follow the daily flow regime of the Lehigh River and Francis E Walter releases, this week should be an interesting one. This Saturday the Corps is supposed to have its first whitewater release of the season. However, this release is dependent upon Francis E. Walter being at its summer recreation pool level of 1,370'. The thing is, it is currently not at that level, and most likely it won't be by the time next Friday, midnight rolls around. And unless we get some rains, heavier than just your garden-variety showers, the agencies are going to have to decide on what to do. The whitewater crowd claims to be conservationists, and the reason this 1,370' level has been established is to conserve the coldwater pool in the lake. So the question is, do they put their interests ahead of what has been established to protect the aquatic ecology of both the lake and downstream? I guess this week we will really see how conservation-minded they really are. But the bottom line is, deviating from the Plan sets a very bad precedent in my opinion! With the Corps still trying to fill Francis E Walter to 1,370' (the summer recreational pool level) - - releases will continue to stay at 200cfs. In fact I don't see us deviating from this release for the foreseeable future! At this cfs the river does not get much easier to wade! And up by the dam it is pretty much a walk in the park (for the Lehigh that is!). So get out there and check it out. Sulphurs should be on any day now. May 1, 2012 - NJ Salt! 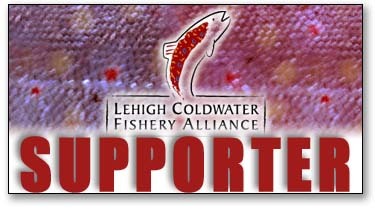 It's that time of year to seek out your springtime striper haunt! The fish should be there. 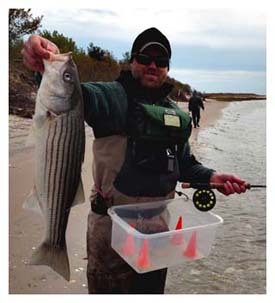 Over the weekend we were able to hit up one of our favorite early-season striper sites, and we were not disappointed. As has been the case in the past, small and sparse clousers were the ticket. Color choice of the day was a yellow over yellow clouser tied on a size 1/0 hook. For the dumb-bell eyes we were using slightly weighted lead eyes or even bead-chain eyes. With favorable winds and tides we managed to put together some really long swings, which the fish seemed to like. As the outgoing tide began to slow, we managed to find a few hickory shad in the mix as well. They seemed to be riding the last bit of the outgoing. Probably looking to maximize on the warmest water of the falling tide. If you've never caught hickory shad, they can be a lot of fun. They seemed to like the clouser on the drop. The action should only get better from here on out, through June. Who knows, maybe this will be the year we get into some weakies. It has been a long time! They've pretty much all but disappeared.